The instrument is very similar to Epact 86254. It is composed of five copper superimposed discs, the central of which has a handle in the form of a double dragon's head. 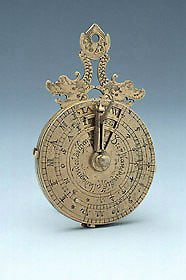 On one side of the dial is a brass arm with a pierced and engraved lunar volvelle, showing the phases of the moon. There is also a perpetual calendar, showing the total days of the current month, the length of the night and of the day and the ruling planet for the current day. On the other side of the dial is a folding gnomon indicating unequal hours. There are some engravings on the sides of the plates which are not visible when the instrument is assembled.